Performing works from Bartok to Gershwin and from Led Zeppelin to their own award winning compositions, guitarist Brad Richter and cellist Viktor Uzur consistently garner stand-up-and-cheer ovations and rave reviews. Hailed as “one of the most exciting duos on the scene today” (Guitar International), they will perform a program featuring original compositions, Balkan music, and arrangements of music by the Beatles and Led Zeppelin. Classically trained artists of the highest caliber, Brad and Viktor studied at two of the world’s foremost music institutions – The Royal College of Music and The Moscow Conservatory, respectively. Brad, a former US National Finger-Picking Champion, has won numerous prizes for performing and composing. Viktor is former principal cellist and soloist with the Moscow Chamber Orchestra, and a prizewinner at many international competitions. 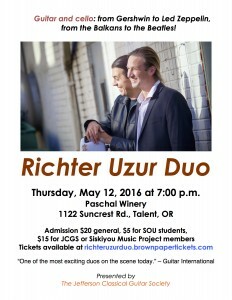 Admission is $20 general, $15 to members of the Siskiyou Music Project and the Jefferson Classical Guitar Society, and $5 to SOU students with ID.